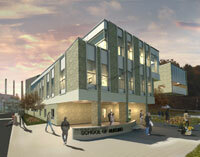 Artist's rendition of the new academic building for FIMS and Nursing. The landscape at the corner of Huron Drive and Lambton Drive is changing to accommodate Western’s new, innovative academic building for FIMS and Nursing. “Early Works”, which prepares the site prior to the build, has been issued and will commence in early October. During this stage of the project infrastructure will be routed, the grounds will be sculpted, and construction barriers will be installed. Select portions of green space are being preserved and the project will follow Western’s policy to replant at least one tree for every tree removed. Much of the new spacious courtyard and surrounding curbside will be enhanced with plants that are representative of the removed material and compliments the area. The temporary parking lot on the south-west corner of the intersection will be reclaimed. An additional 170 grey permit spaces have recently opened in the nearby South Valley lot. 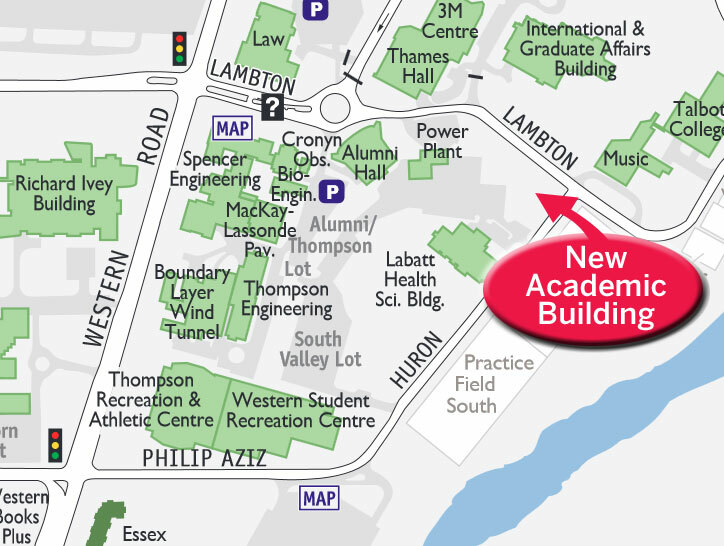 The nearest coin entry visitor spaces can be found in the Huron Flats lot, across from the Student Recreation Centre. Infrastructure and fence installation will begin immediately and may lead to intermittent closures to both the walkway and adjacent roads. Motorist and pedestrians can expect minor delays when travel through the area. 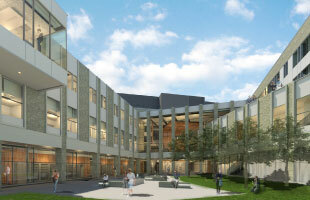 The four-storey building will occupy 130,000 square feet at the corner of Lambton and Huron drives, next to the Arthur and Sonia Labatt Health Sciences Building. Construction of the facility itself will begin in January and will continue until early 2017.
Who is affected by the construction? The pay-and-display parking lot will no longer be available once construction begins. There will be temporary delays to pedestrians and motorists travelling through the intersection at select stages of construction. How will my commute be affected? Construction is scheduled to commence in January and complete in early 2017 and may impact the surrounding roads and pathways. Western officials are asking the community to remain patient during the construction and find alternate routes when possible. Where can I learn more about the construction? Western is tracking construction and posting project updates in the right column of this webpage and on Twitter, @westernu. Will any of the green space be affected? Portions of green space are being preserved and the project will follow Western’s policy to replant at least one tree for every tree removed. After completion, the building site will be enhanced with plants that are representative of the removed material. The two memorial trees currently on the site will be replanted elsewhere on campus. Why is the building being built? 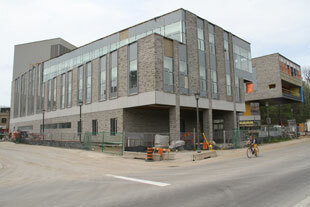 After the old Services Building was decommissioned, the site became an ideal spot for growing academic programs, Faculty of Information and Media Studies and Nursing. Construction is on schedule. Exterior brick/stone work continues on the north facing side. September - The foundation is complete. Structural steel will be installed by end of September. October - Floor slabs will be complete by mid October. November - Roofing will be complete and building will be enclosed by mid November. December - Exterior sheathing will be completed by end of December. January - June - Masonry/stone work. The general contractor is Norlon Builders. Norlon was recently contracted to complete the Delaware Hall modernization project, as well. Corner of Huron Dr. and Lambton Dr.